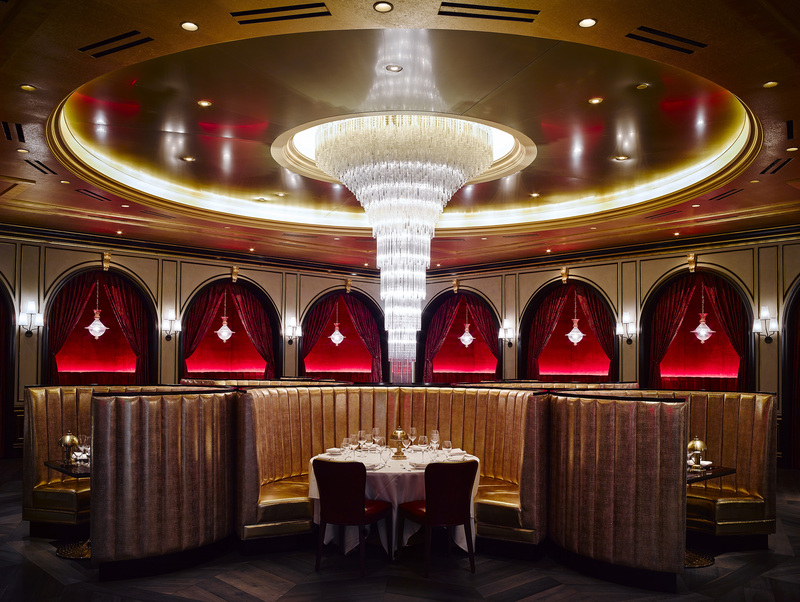 The Red Room at Carbone, photo courtesy of Aria. Italian food is always a good bet for date night and Carbone will help you turn it up a notch. 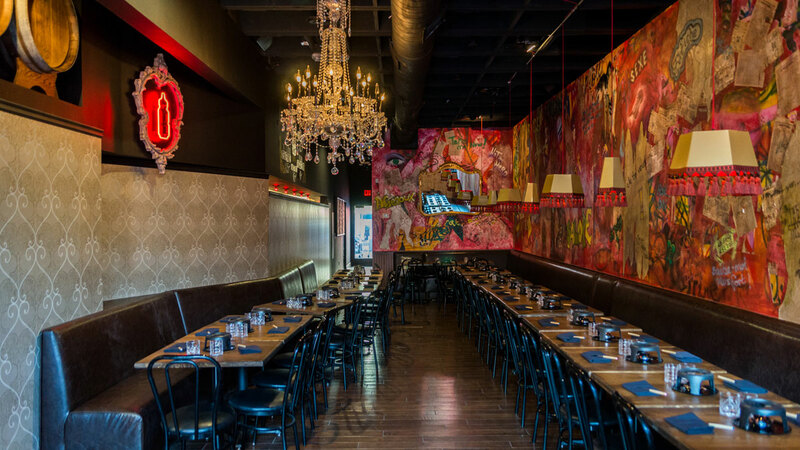 The whole restaurant is beautiful, but if you want to impress your date, be sure to reserve a table in the restaurant’s Red Room, which was inspired by the Milan Opera and features a floor-to-ceiling Murano glass chandelier. There are also very romantic semi-private booths lining the room, which are perfect for couples. Wine and dine with Italian favorites like veal marsala, lobster ravioli, chicken scarpariello and spicy rigatoni vodka paired with wines from Italy, France and America with vintages dating back to 1929. 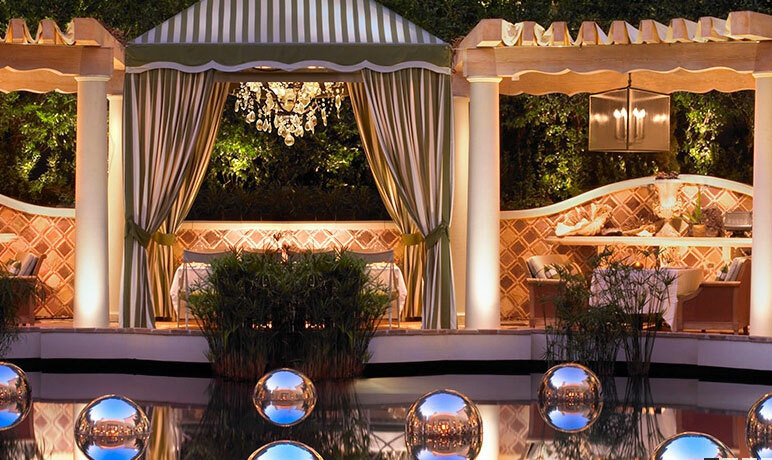 The patio at Lago, photo courtesy of Bellagio. It’s all about location at Lago at Bellagio. You’ll score points with your date if you grab a table by the floor-to-ceiling windows or a spot on the coveted outdoor patio. 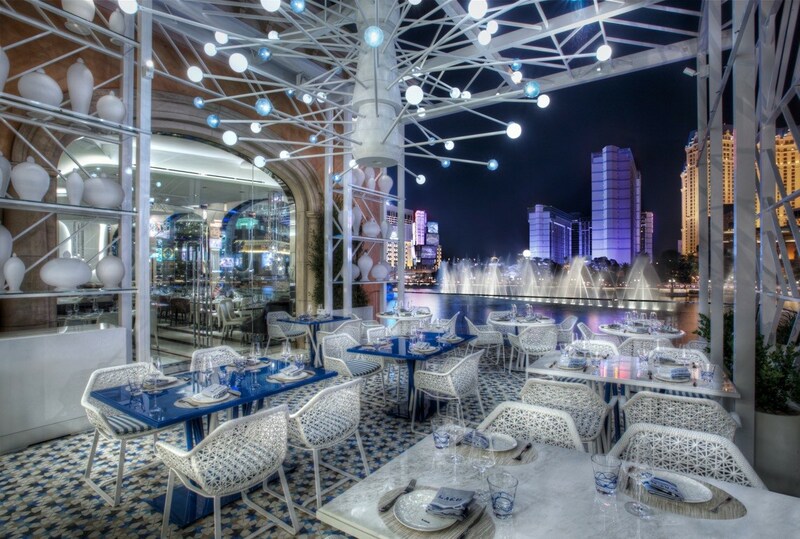 Lago offers stunning views of the Bellagio Fountains as well as the Eiffel Tower at Paris Las Vegas across the street. The view isn’t the only impressive thing here. The food is pretty darn good too. Michelin Star chef Julian Serrano serves fresh Italian cuisine, seafood favorites and delectable desserts. 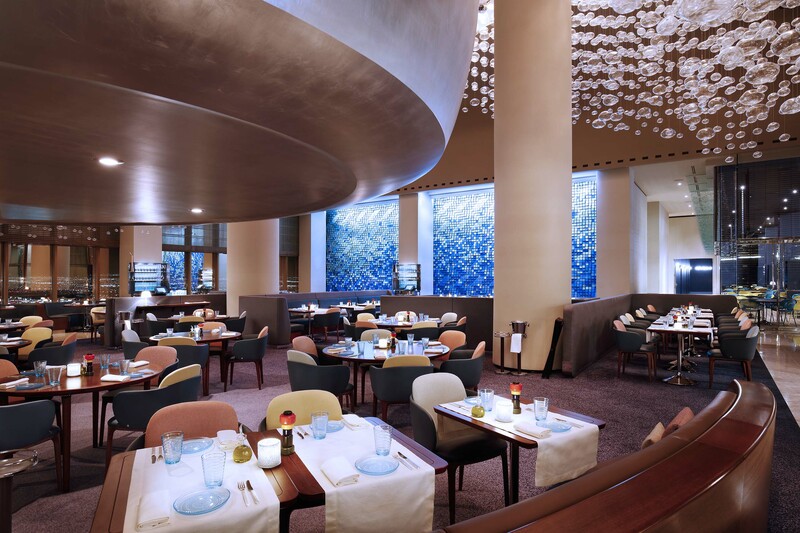 The dining room at Rivea, photo courtesy of The Delano Las Vegas. If you’re looking for a place with that “wow” factor, head to Rivea on the 64th floor of The Delano for amazing 180-degree views of the Strip and cuisine from renowned chef Alain Ducasse. The restaurant has stunning views from inside the dining room as well as an outdoor balcony. Enjoy food inspired by the markets of Provence and Italy and then head next door to the beautiful Skyfall Lounge for handcrafted after-dinner cocktails. Skyfall offers equally amazing views and an outdoor patio perfect for taking in the scenery. The Eiffel Tower Restaurant overlooks the Bellagio Fountains, photo courtesy of Paris Las Vegas. We all know Paris is the City of Love but if you can’t get overseas for Valentine’s Day, this is the next best thing. 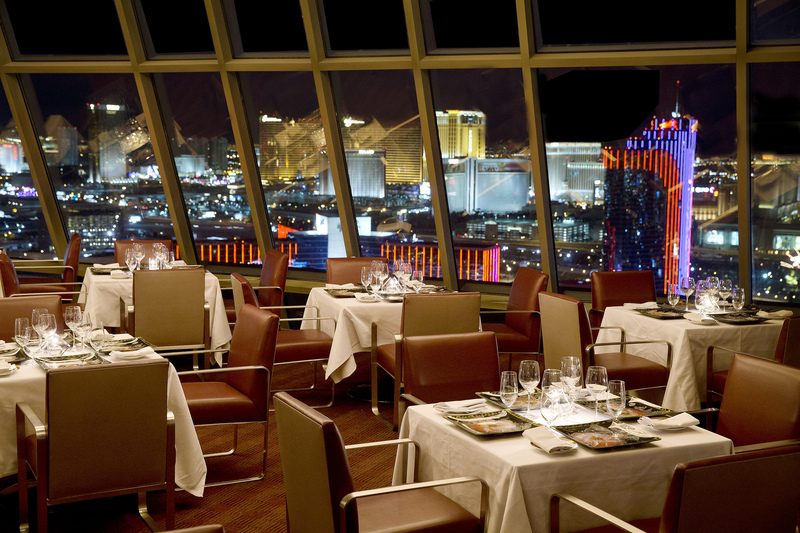 Las Vegas has a faux Eiffel Tower with a gourmet restaurant 100 feet above the Strip. 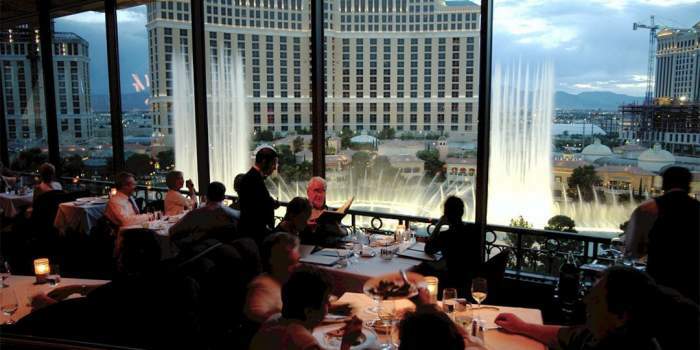 The restaurant offers views of the Bellagio Fountains across the street from its floor-to-ceiling windows. 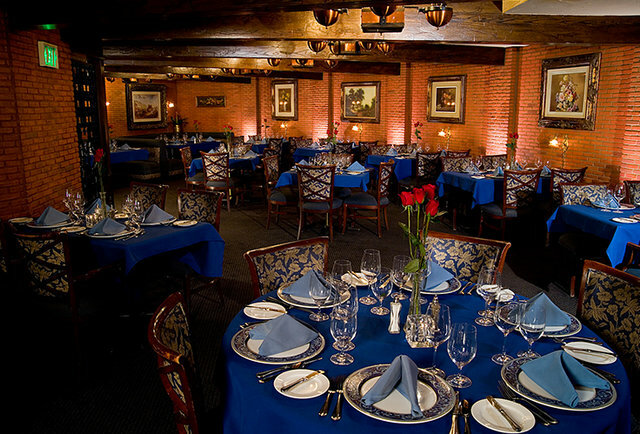 Dine on fine French food like foie gras, escargots, a variety of steaks and seafood. The Eiffel Tower restaurant is a great place to pop the question with its special proposal packages, which include things like a window table, a custom dinner menu, champagne, roses and a photo. Engagement rings can also be delivered in a special handmade ring box or with a special dessert. Hugo’s Cellar, photo courtesy of Four Queens. If you want to get old school classy, take your date to Hugo’s Cellar downtown. The restaurant, which opened in 1973, still has that ’60s and ’70s Vegas gourmet room vibe and service. Everything is nostalgic here from the brick lined walls to the booths to the fact that all ladies are presented with a rose when they arrive. Hugo’s offers great tableside services you just don’t see in many restaurants today – and a great value. The restaurant serves hearty steaks, lamb, chicken and more. Included with your main course is Hugo’s tableside salad, bottled water, assorted breads, sorbet to cleanse your palate, vegetable, potato and chocolate dipped strawberries, apricots and baby figs with a fresh cream dip for dessert. F. Pigalle is themed around Paris’ red light district. Photo courtesy of F. Pigalle. F. Pigalle, 508 Fremont St. If you are looking for something on the steamier side for Valentine’s Day, head to F. Pigalle. The intimate restaurant is named for the red light district of Paris and the décor reflects that theme. The “F” in F. Pigalle stands for fondue, which is basically the entire menu. You and your date can share cheese, steak or shrimp fondue for dinner and dip sweet treats in chocolate fondue for dessert. Head outside after dinner to the red-lit patio out back for cocktails. Alizé offers amazing views from the top of the Palms, photo courtesy of Alizé . Alizé is celebrated Chef André Rochat’s French restaurant atop the 56th floor of the Palms’ tower. 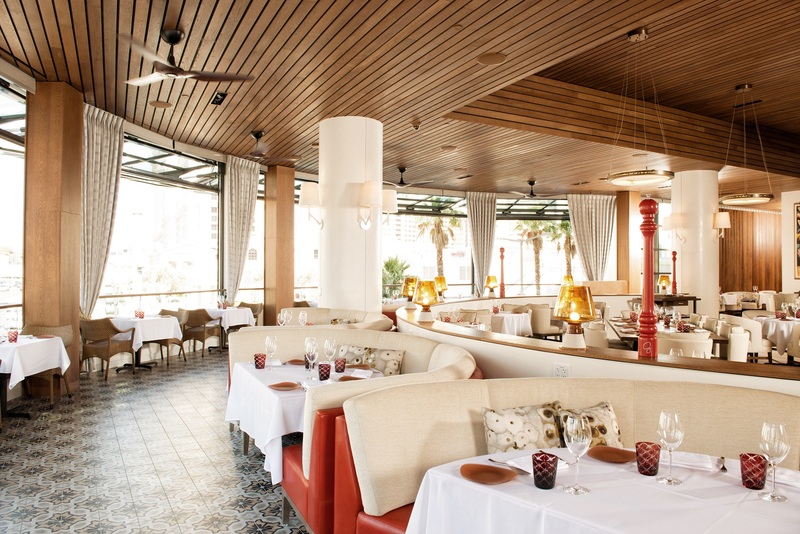 With breathtaking views of the Las Vegas Strip and beyond, the atmosphere at Alizé is definitely romantic. Cuisine at Alizé includes classic French dishes like escargots, pan-seared foie gras, French onion soup and a delicious Dover sole. For Valentine’s Day guests can enjoy a five-course dinner while admiring the 280-degree panoramic view. Alizé also has special treasure chest boxes for occasions like Valentine’s Day. The guest receives a key and gets to open the chest. Inside the treasure chest there is an ornately decorated cake — a great way to treat your date to a special dessert or perhaps pop the big question if you want to put a ring in the box as well. Top of the World, photo courtesy of the Stratosphere. Of course a restaurant atop the tallest building west of the Mississippi offers fabulous views. 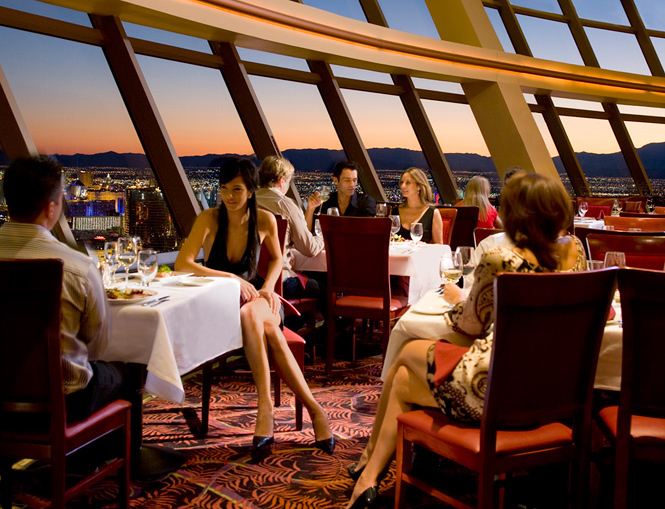 But Top of the World at the Stratosphere hotel really goes over the top, rotating 360 degrees throughout your meal to offer views of the entire Las Vegas valley. The restaurant is perfect for proposals with special packages that include roses, a photo, champagne and a chocolate box for the ring presentation. Giada offers views of the Strip and Bellagio Fountains, photo courtesy of Caesars Entertainment. Giada, from celebrity chef Giada De Laurentiis, has a beautiful dining room that offers beautiful views of the Strip and Bellagio fountains across the street. The large garage-style windows are also retractable, giving guests an al fresco dining experience when the weather is nice. The cuisine features Italian dishes with lighter California influences. On Valentine’s Day the restaurant will be serving a tasting menu with antipasti for two, a choice of risotto or pasta, a choice of main entree and a dessert of either drunken berries over vanilla semifreddo or a dark chocolate macaroon cake. The lagoon at Costa di Mare, photo courtesy of Wynn Las Vegas. Costa di Mare serves fresh Mediterranean seafood and Italian coastal cuisine from Chef Mark LoRusso. The restaurant works with local fisherman and markets from every region in Italy to offer things like langoustines, Mediterranean blue, spiny, and slipper lobsters, imperial red prawns and daily specials like Venetian soft-shell crab. There are two levels of seating inside, but if you really want to get romantic, reserve a semi-private table surrounding an intimate lagoon outside.